Now That a Court Has Struck Down Obama's Recess Appointments, Will Republicans Allow Them to Be Confirmed? Now That a Court Has Struck Down Obama’s Recess Appointments, Will Republicans Allow Them to Be Confirmed? WASHINGTON, DC - JANUARY 22: Former U.S. 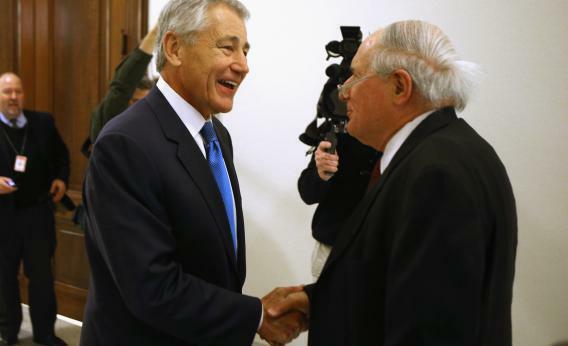 Senator Chuck Hagel (L) greets Senate Armed Services Committee Chairman Carl Levin (D-MI) after Hagel met with Sen. John McCain (R-AZ) on Capitol Hill January 22, 2013 in Washington, DC. Nicole Flatow reports that the D.C. circuit (filled, she notes, with Republican appointees), has ruled against President Obama’s recess appointments to the National Labor Relations Board. But why did the president make recess appointments, anyway? Why didn’t he fill the board? Get ready to be surprised: Because Republicans and (two Democrats) had consistently filibustered his nominees. The NLRB was basically non-functional for two years, and for more of 2011 and all of 2012 House Republicans refused to actually adjourn, meaning they were not “in recess.” So Obama proceeded as if the Congress was recessed, made the appointments, and fought the lawsuit. Now that he’s lost it, besides appealing the decision, how can he make the appointments? Funny enough, less than 24 hours ago the Senate passed minor rules reform, but stopped short of altering the filibuster that nuked these nominees and the nomination of Richard Cordray to run the Consumer Finance Protection Bureau. I asked Sen. Carl Levin, a key mover behind the compromise, whether the rules would allow the president to get Cordray through. But he was taking that on faith. It wasn’t like 2005, when Republicans threatened to change the Senate rules on judicial nominations, the original “nuclear option” fight. That battle ended when a bipartisan group of senators agreed to give up on the rules change – and to break the filibuster on three nominees for circuit courts. Why didn’t Democrats make a deal like that in the rules reform fight? Great question. Because Republicans have shown an admirable resilience and sense of revanchism on filibuster fights. The most famous, filibustered judicial nominee in the Bush years was Miguel Estrada, a young, conservative Hispanic lawyer seen as a potential Supreme Court nominee. He withdrew his nomination after two years of filibusters. And that made this part of the D.C. circuit decision especially sweet.